I guess for any coin collector – certainly metal detectorists, the excitement of uncovering hidden treasures are what dreams are made of. Hoxne Hoard: Display case at the British Museum showing a reconstruction of the arrangement of the hoard treasure when excavated in 1992. 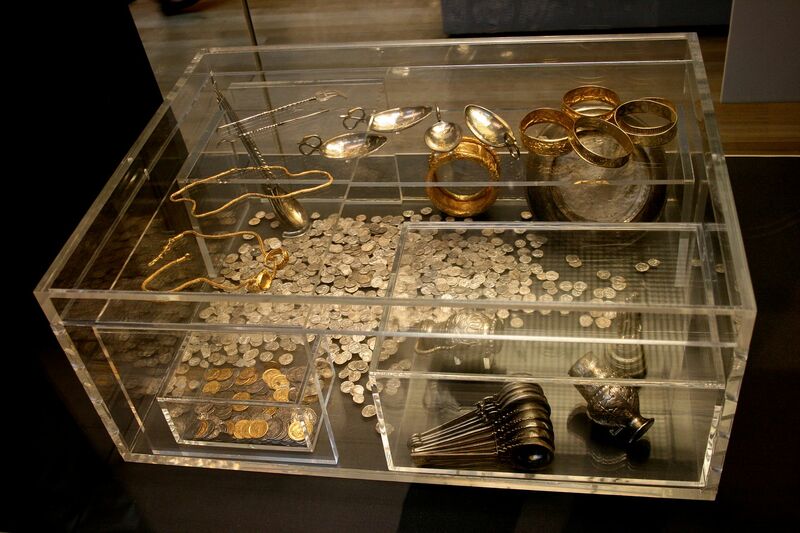 The Hoxne Hoard is the largest hoard of late 4th century Roman silver and gold ever discovered in the United Kingdom. The hoard of treasure was discovered on November 16th, 1992. Farmer Peter Whatling, from the village of Horne in Suffolk, had lost his hammer in his field and had asked his friend, a retired gardener and amateur metal detectorist to help him look for it. While searching the field Lawes discovered silver spoons, gold jewellery and numerous gold and silver coins. Upon alerting landowners and the local police, a team of archaeologists from the Suffolk Archaeological Unit carried out an emergency excavation of the site and discovered 14,865 Roman gold, silver and bronze coins from the late fourth and early fifth centuries along with approximately 200 items of silver tableware and gold jewellery. The objects are now in the British Museum in London and are said to be worth around £3.1 million. As for the errant hammer? That’s now in the British Museum, too! In July, 2009, Terry Herbert was using his metal detector on a recently ploughed field in Staffordshire when he discovered the largest trove of Anglo-Saxon treasure ever found. Over 3,500 military items were discovered including weaponry items as well as several religious artifacts and decorative items. It is said that the hoard dates back to the 8th century and has influenced the way historians think about that period in English history. Valued at approximately £3.3 million, it has since been purchased by the Birmingham Museum & Art Gallery and the Potteries Museum & Art Gallery. 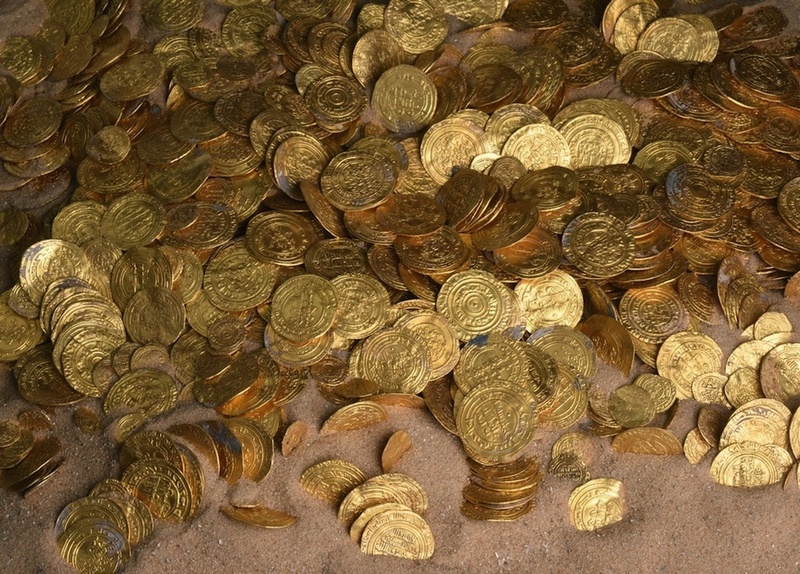 Nearly 2,000 gold coins were discovered off the coast of the ancient city of Caesarea, Israel. The gold coins are about 1,000 years old, and were minted by the Fatimid Caliphate, which ruled much of North Africa at the time. In 2015 a group of Scuba divers were exploring the sea bed near the harbour of Caesarea National Park, Israel. They thought they had stumbled across a child’s toy when they found the first gold coin, but when they saw how many more there were and looked more closely at the engravings on them, they realised they had in fact discovered something a lot more significant. Almost 2,000 coins were recovered, all of several different denominations and had been minted at different times. The earliest coin found in the treasure was a quarter dinar minted in Palermo, Sicily in the second half of the ninth century CE. Most of the coins though belong to the Fatimid caliphs Al-Ḥākim (996–1021 CE) and his son Al-Ẓāhir (1021–1036), and were minted in Egypt and North Africa. The exact value of the coins today is still unknown. Coins and bullion from the Harrogate hoard. Discovered January 2007. In January 2007, semi-retired businessman David Whelan and his son Andrew discovered the Harrogate hoard using metal detectors near the town of Harrogate in North Yorkshire. 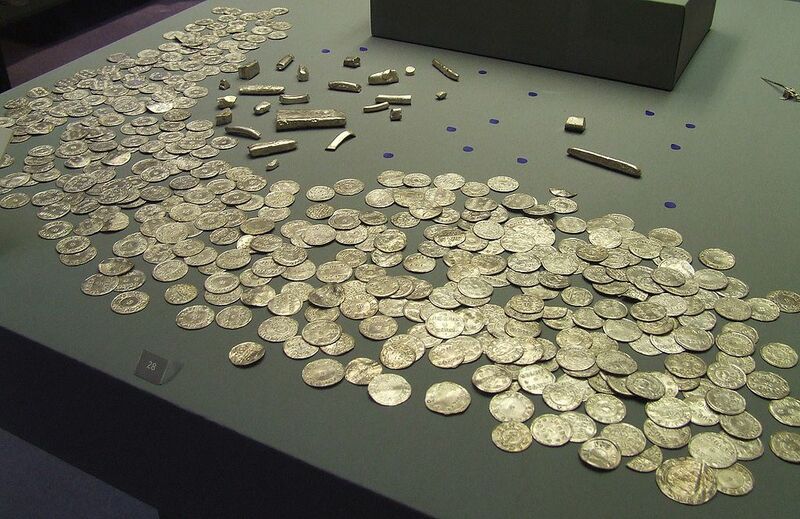 It was the largest Viking hoard discovered in Britain since 1840 and consists of 617 silver coins and 65 other items, including ornaments, ingots and precious metal – all of which was hidden in a gilt silver vessel lined with gold which was made in France or Germany around 900. The coins date from the 10th Century and come from all over Anglo-Saxon England, as well as parts of Asia. Reports indicate that the coins bear Islamic, Christian, and pre-Christian Norse pagan symbols. The independent Treasure Valuation Committee valued the hoard at £1,082,000. 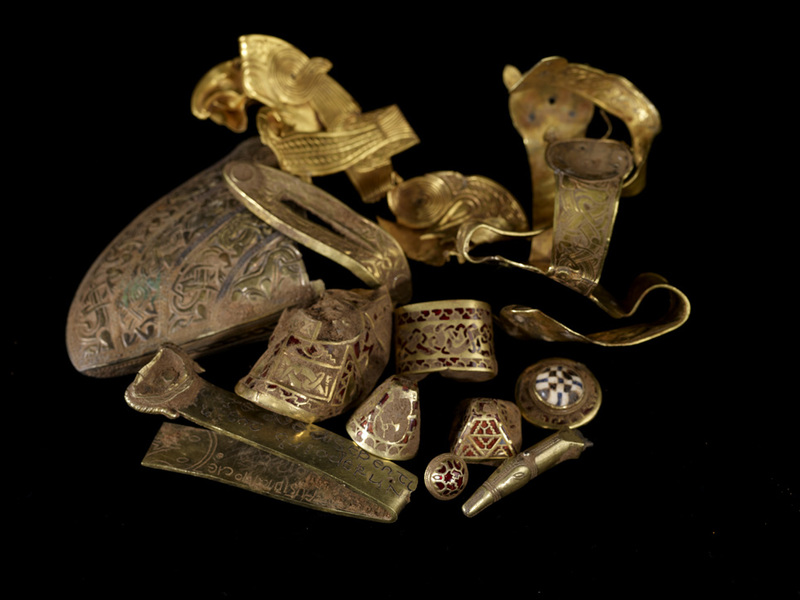 The hoard was purchased jointly by the York Museums Trust and the British Museum. The Frome Hoard of 52,503 Roman coins. In April 2010, metal detectorist Dave Crisp discovered 52,503 Roman coins near Frome in Somerset. The coins were contained within a ceramic pot and date from AD 253 to 305. Most of the coins are made from debased silver of bronze and was the equivalent of four years of pay for a Roman legionary. Weighing 350 pounds, the coins may have been buried as an offering for a good harvest or auspicious weather. The hoard is one of the largest ever found in Britain, and is also important as it contains the largest group ever found of coins issued during the reign of Carausius, who ruled Britain independently from 286 to 293 and was the first Roman emperor to strike coins in Britain. The hoard could fetch at least £250,000 today. You can now own your own treasure chest containing 1kg of mixed coins, medals and tokens from all around the world.